Yes you can get some impressive results from a weight-free workout, especially with these potent bodyweight moves. Don’t get me wrong, I love the gym. I enjoy pushing weight, using equipment, and getting inspired by fellow gym-rats. But, there are plenty of times when we just can’t get there. That’s why I love bodyweight exercises- you can train anywhere, and you don’t need any equipment. When asked to my pick my top 25 bodyweight movements, I chose exercises that most generally fit people can perform. 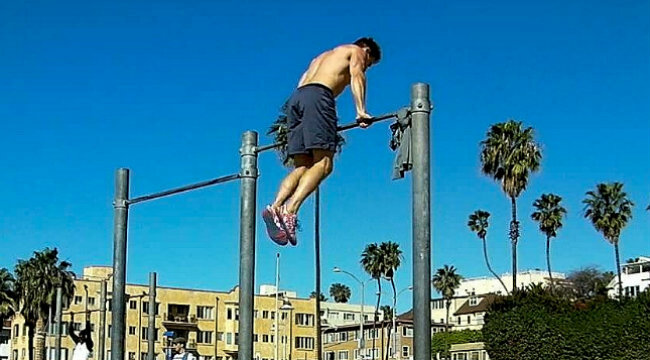 There are plenty of crazy moves out there that are fun to watch, but not many can perform slow-motion-one-handed-pull-ups, or behind-the-back clap, plyo push-ups. This is a list of practical and functional movements, which build strength in all muscle groups. Most bodyweight training involves multi-joint movements, so it’s great for total-body fitness. This list shows some emphasis on targeting certain “primary movers,” starting with lower body, moving into upper body, and finishing with core. There is also a bonus move at the end that demonstrates how to put several moves together into a compound exercise. These exercises are proven to make you lean and mean. So choose a move or two for the major muscle groups and throw them into a circuit. The variety and challenge will be good for your body AND mind. One of the simplest yet most effective exercises you can do! Glutes, quads, hamstrings are doing a lot of the work. Progressions: There are many! 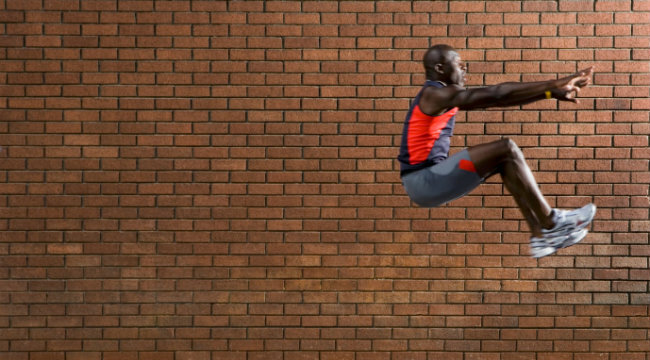 Single-leg, pistols, squat-jumps, etc. Coaching Tip: “Numbers up!” This means think about the uniform numbers on your chest- if I can’t read them, you’re leaning forward too much. Explosive power comes from glutes, quads, hamstrings, calves primarily. Progressions: Quick repeats (plyometric training- reducing transition time between the eccentric and concentric muscle action) Single-Leg, Improve distance and height, etc. Coaching Tip: Train like an athlete! Compete! Stabilization and strength move for glutes and hamstrings primarily. Core aids in control. Progressions: Add resistance in one or both hands. Change tempo. Coaching Tip: Kick the door open with extension behind you. Only move as quickly as you can remain under control. 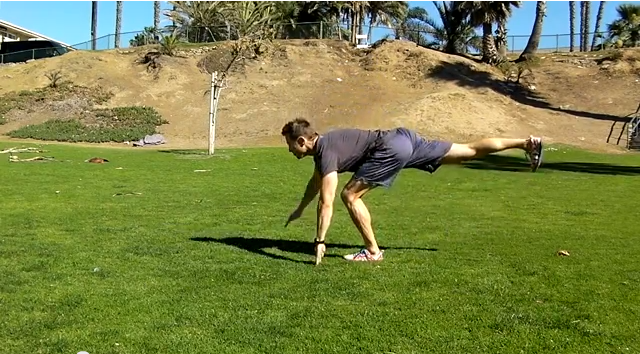 Simple effect of touching the ground in front of you is that of making this more “functional” and athletic. Sagittal plane is basically moving forward and back. Glutes, quads, hamstrings, calves primarily. Progressions: Add resistance to one or both hands. Further- throw hands above head when you push back up, increasing the load on the front leg. Do in combination with the other two planar lunges. Coaching Tip: You don’t need to step too far- stay controlled and be intentional about your knee placed above your foot. Again, touch ground in front of toes. Frontal Plane is basically moving side-to-side. Glutes, quads, hamstrings, calves, along with Abduction and Adduction complexes. Coaching Tip: Again, control the knee to stay medial (inside) of the foot. Also, keep your eyes up like an athlete. Transverse Plane is basically rotational. Glutes, quads, hamstrings, calves primarily. Coaching Tip: The stepping foot goes to the rear 45 degree direction, while the planted foot stays pointed to the front. Eyes up! Progressions: Plyometric repeats. Add resistance to one or two hands. Improve height. Coaching Tip: Stick the landing and pause- remain under control, explosively! Numbers up, Eyes up! Simple way to train the gastrocnemius and soleus processes. Progressions: Single leg, add resistance. See VIDEO at end of this article for demonstration of all 25 moves.